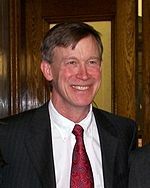 In a recent interview, Colorado Governor John Hickenlooper stated his opposition to the death penalty, citing the views of murder victims' family members and the high cost of implementing capital punishment. Hickenlooper said he had supported the death penalty until he learned more about it. “My whole life I was in favor of the death penalty," he said, "But then you get all this information: it costs 10 times, maybe 15 times more money to execute someone than to put someone in prison for life without parole. There’s no deterrence to having capital punishment. And I don’t know about you, but when I get new facts, I’ll change my opinion. I didn’t know all of this stuff." In 2013, he granted an indefinite reprieve to death row inmate Nathan Dunlap, saying, “If the State of Colorado is going to undertake the responsibility of executing a human being, the system must operate flawlessly. Colorado’s system for capital punishment is not flawless.” Because of the general basis for Hickenlooper's grant of a stay, it would appear to put a hold on all executions while he is governor. (E. Stokols, "In interview, Hickenlooper offers new anti-death penalty stance, light support for Keystone," Fox31, August 18, 2014). See New Voices and Costs.